With the year winding down, Kaunas, Lithuania‘s second-largest city, has received some heart-warming news that, potentially, can prompt more upbeat front-page headlines in the future. This week, Germany’s Continental, a leading German automotive manufacturing company specialising in tyres, brake systems, interior electronics, automotive safety, powertrain and chassis components and other parts for the automotive and transportation industries, announced of intentions to build a factory in Kaunas and invest 95 million euros in the facility, becoming the biggest greenfield investment in Lithuania’s history. The news was followed by the other head-line grabber by Hollister, a US-based global manufacturer of medical devices and equipment, which on Wednesday, November 8, announced of launching construction of a 50-million-euro production complex in proximity of Kaunas. Another German automotive giant Hella started building a 30-million-euro plant in the Kaunas free economic zone (FEZ) in mid-October. Continental plans to create around 1,000 new jobs in the new electronic components plant, governmental foreign investment promotion agency Invest Lithuania said on Monday, November 6. Egidijus Jurgelionis of the agency told BNS that the exact location of the new plant was yet to be announced. In the new facility in the Kaunas district, Continental will produce passenger safety and smart driver assistance systems, including door and seat control units, gateways and intelligent glass control units as well as radar sensors for comfort functions such as Adaptive Cruise Control (ACC) and safety functions such as Emergency Brake Assist (EBA). «Building the first Continental plant in Lithuania is an important part of our growth strategy in Europe,» Hans-Jurgen Braun, head of 28 Central Electronic Plants worldwide at Continental, is quoted as saying. «Continental’s decision to set up in Lithuania may be the key breakthrough that will cause not only car manufacturers but also other major participants of the supply chain to pay close attention to Lithuania,» Mantas Katinas, managing director at Invest Lithuania, said in a press release . Shayan Ali, future CEO of Continental in Lithuania, said production was expected to start by mid-2019. Founded in 1871, the technology company generated sales of 40.5 billion euros in 2016 and currently employs more than 227,000 people in 56 countries. Meanwhile, Hollister, a US-based global manufacturer of medical devices and equipment, has launched construction on a 50-million-euro production complex close to Kaunas. The production facility on the Kaunas free economic area is expected to create around 300 new jobs. Headquartered in Illinois, Hollister has manufacturing and distribution centre on three continents and offices in over 25 countries. It sells products in more than 80 markets around the world. According to Invest Lithuania, the past year of 2016 was «another record-breaking year» for foreign direct investments (FDI) in Lithuania and this year has produced even more foreign direct investments (FDI). Lithuania attracted 36 FDI projects in 2016, which were thought to create 3,716 jobs over the next three years. By comparison, 28 foreign capital companies decided to set up operations in Lithuania in 2015, creating 2,370 jobs. The year of 2017 has started off with a major arrival– Holland’s Macaw, an award-winning employer and digital solution provider, announced it is establishing in Vilnius its first office outside the Netherlands. Some of the other newcomers this year are worth mentioning, too. The Danish window and door manufacturer Dovista set up a division in Marijampolė in southern Lithuania and is implementing one of the largest greenfield investment project in the country’s history; Ryanair has expanded its aircraft maintenance base in Kaunas. Swedish capital companies were the biggest creators of jobs in Lithuania in 2016: over the next three years they plan to employ 1,340 specialists in Lithuania. German companies came second with 750 new jobs planned, whilst Danish and Finnish capital companies are set to create 300 new positions each. In 2016, foreign direct investment projects were also brought to Kaunas, Klaipėda, Panevėžys, Marijampolė, Kėdainiai and Vievis. Yet against the European background, Lithuania‘s performance in foreign direct investments (FDI) seems quite lacklustre. In mid-2017, the FDI level per thousand inhabitants stood at 5,2 in Lithuania and, in that regard, only Romania (3,7) and Greece (2,7) did worse, meanwhile Latvia and Estonia, the other Baltic neighbours, boasted a remarkably better indication – 15,9 in Estonia and 7,4 in Latvia. In another EU FDI ranking in the past summer, evaluating the EU member states’ investment capacities, Lithuania was also placed at the very bottom in most of the parameters (outward and inward FDI stocks, outward and inward FDI flows), although in some of the graphs Lithuania has improved, sitting comfortable in the mid-section of the ranking. 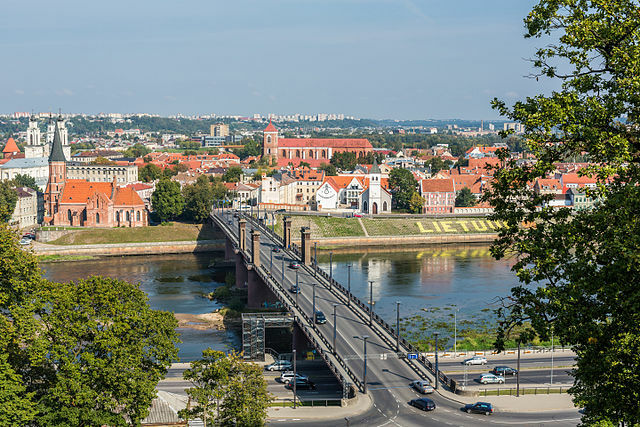 Lithuania has long positioned itself as a country with a cheap workforce, but due to the EU’s record-high emigration and bad demographics, it has become pretty expensive in recent years and cannot lure investors with a cheap labour, experts note. «Indeed, a dozen years ago, many UK and German textile manufacturers were eager to open up here (Lithuania)… paying the tailors 300-400 euros. Now the wage has risen by three times. Other investors see a similar spike in the labour costs,» says Sigitas Besagirskas, president of Vilnius’ Industry and Business Association (LPVA). Importantly, in the age of high-tech innovations and digital services, it is a high technology industry that encourages larger FDI into countries. Yet, Lithuania cannot boast of them – the high-tech industry’s input into the year’s GDP is a mere 2,5 per cent, one of the worst indicator in the EU. In comparison, it is 4,5 per cent in Estonia, the Baltics’ leader, and the EU’s statistical average is 4,7 per cent. «Unless we manage to turn it around, the prevailing low and mediocre technological level manufacturing will get us nowhere,» the expert noted. According to the LPVA head, the issue of shrinking workforce and scarcer tax money in the state coffers can be addressed through automatization and robotization of the production and service sectors. «The essence is simple: already innovative companies become more such and those employed earn more and contribute more in taxes to the social security budget. Only that way the increasing army of the unemployed can be handled without a strain to the state,» Besagirskas told BNN. For Lithuania, the polestar should be Ireland that has enjoyed a marvellous economy run since 2008 economic crunch. To mirror the Irish success, Lithuania needs not only to overhaul its tax system, which is subject to multiple changes with a new government in office, but also thoroughly review its labour laws and overhaul the education system experts believe. The country’s education system encompasses 47 universities and colleges in Lithuania. Although the demand for the specialties in most of them is way lower or non-existent, yet the schools, whose funding depends on the number of students, keep them intact. For Besagirskas, the pillar of a country’s success is its image in the world. «Again, Estonians can boast of Skype and zero profit tax for reinvested profits, although the latter does not always work well in the country,» he says. According to the expert, Lithuania ought to do «way more» in servicing foreign investors. «What is often characteristic for us that we tend to do only the initial work – meet the investor, sit down with him and sign an agreement. After that, the investor often is left alone puzzled how to get permits, where to find necessary workforce and et cetera. Only the Tauragė and Panėvežys municipalities stand out as the most investor friendly and helpful municipalities,» Besagirskas emphasised.